The recent events in Haiti have been weighing on all of us in different ways, I'm sure. The news coverage is phenomenal. It's hard to turn on the TV and not see the devastation. The Big Picture is updating often. Recent photographs here. I'm torn with what to discuss with Carter. We've touched on the basics and he seems to grasp the reality of the situation. While I don't want to scare or further upset him, I want him to see the differences in our lives and appreciate what we have here in the United States. The simple things......food, shelter, education, etc. While we've always tried to instill a sense of charity in our kids, the need to give now seems to be an even greater opportunity for learning. Sacrifice....the smallest luxuries....and donate that money to the cause. ***Skip dinner out.....make a box (or two, in our house) of mac 'n cheese instead.....send $30. ***Make coffee at home......send $5. ***Do without whatever it is you can.....and send the equivalent. And, if you feel comfortable doing so, explain your intentions with your children and show them how we can all help. Empower them to participate and sacrifice for others - even if it's as simple as trading a happy meal for dinner at home. As I have said many times before, I believe charity is one of the greatest gifts we can give to our kids. It's also a lot more fulfilling than a quick meal with too many empty calories. Text HAITI to 90999 to donate $10 to the Red Cross. I've recently been turning the news on purposely. Blake just doesn't get it without the visuals. I wouldn't keep tuning in if I thought it scared him but he really needed to see the visuals and hear the stories to understand the enormity of it. We regularly help people but haven't helped with Haiti yet. When we do, we'll definitely explain what we're doing so they understand. This definitely puts things into perspective! A lot of our unnecessary purchases each day can go to a bigger and better cause. Wow, that really makes you think how easy it is to find ways to donate. Great post! You are right. I know we definately live more selfishly that we should at times and those in Haiti losing thier basic needs is everything to them. I appreciate you sharing your point of view. Each photo is more devastating and heart-wrenching than the one before. Good for you for sharing easy tips on how to give! Thanks for the post Casey.Great ideas on how we could make a difference. I have a 9 year old daughter and we have talked to her some because of a class project from a few years ago. It's hard for them to wrap their heads around something so far away from home. Kids seem to get the need to give though. Sydney decided that she wanted to do mission work after her class project. I think you are exactly right about giving charity to your children! Charity is definitely one of the most important things we can give our children. Thanks for reminding me of the little things that are easy to give up in order to give to a bigger and better cause. I have discussed what happened with my boys to further reiterate the importance of thinking outside of themselves. It's so important for kids to realize they are not the center of the universe and I mean that in a good way. We, including Austin on his phone now, have all donated via the text message. I cannot even imagine what the people of Haiti are going through. So devistating. Awesome post Casey. I think my kids get it... through the charity:water thing we did. One thing you reminded me though.... I haven't really talked to them about this situation in Haiti. Yes, they know about it, but we don't have the tv on much and I don't think they have seen the pics and know the extent of the devastation. We will be having a little family discusstion tonight at the dinner table to once again show our kids how others are suffering and we need to make a difference. That's what we are called to do. Mike and I talked about it and am going to talk with Project Linus, remember his blanket project? We're going to finish up the blankets we have for the Give a day and Get a day and then work on some for them to send over there. A blanket won't feed a tummy but it will keep that little one warm when there's no house or home to cuddle up in. That will be what we've planning on. Love your ideas. Hope they can find some peace and love that we all are sending their way. This whole thing is so sad! Thank you for your post and putting out there how easy it would be to give just a little. I don't think Ashlyn gets it at all and I don't expect her to. We rounded up our loose change (with Ashlyn) trying to explain to her what it was for. Then she donated the change (and B & I made our own donation) to the Red Cross. Every LITTLE bit helps! My children have a hard time grasping not having food to eat, water to drink, or a home to live in. We talk about what happens in the world and we try to show them the importance of giving to others. Our church did a second collection on Sunday and the money is going to Haiti. I am right there with you, Casey. We are doing all we can to help as well. It is absolutely devastating. What a sweet post. 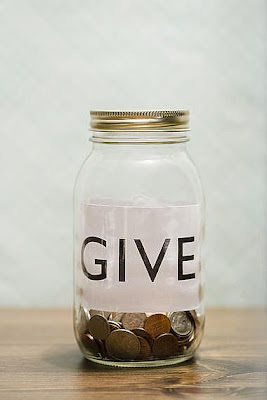 My parents and even my grandparents have instilled a good sense of giving to charity within me. It's great that you are passing on the lesson of helping others to the next generation. Thanks! I was just having this conversation over lunch today at school. This is a great way to think about things... it really made me think about how much money we 'waste'. We don't let our four year old watch the news.. she gets really broken hearted (crying and all) when she hears of things like this.. especially when she sees the news footage. We realized this when she saw the coverage on Michael Jackson's death.. (she didn't even know who he was) but she has not stopped talking about it since. It's really weird. My son (who is ten) has always donated a percentage of his allowance, or held bake sales, etc. to donate to others. What a wonderful idea! I've already donated to Unicef's effort but really want to do more. The email updates they're sending me are breaking my heart! Great post with wise words..thank you for this today! I try to be honest with my kiddos too...as much as they can handle. I think your idea are really doable and good ways to make it work with kids. Nice post. Tone, girls, and I (and maybe my parents) are doing this on Saturday. We've explained a little to the girls, but I think this will help, too. Good for you, Case. Carter's just at the age where it's hard to explain too much or too little. I am posting an article on Friday over at Savvy Moms Save on this...I also put some links on there for how to talk to your kids about the Earthquake, as well as what you can do as a family to help and with your kids. I am taking my kids to Costco to pick up a huge bag of rice and beans..this makes it a little more tangible to them. I feel exactly what you are saying...good job! This is also a wake-up call to all of us who think disaster only strikes elsewhere. We all need to be prepared, whether that means a tornado plan or an earthquake kit.